Video Clip from talk at National Speakers Association Houston program Pro Track about having the courage to make your dream come true. A recent interaction with a horse made a successful entrepreneur burst out: "Now, I really understand why micro managing does not work!". The thought that micro managing does not work was not new to her and her thinking mind. But the horse helped her understand it at a much deeper level, making it possible for her to experience the understanding and integrate it in her leadership. I use horse principles around leadership, emotional intelligence, communication and relationship building to help executives, entrepreneurs and individuals become more effective and in touch with their authentic skills and abilities. The work is done live with horses, in classroom setting without horses and in individual sessions - with or without horses. Horse coaching is experiential and people report that they gain clarity and insight that is transferable and applicable in their lives. See an example in this Video clip from a demo at the 2011 ASTD conference in Orlando with 8000 participants from 81 countries. Over the past few years an increasing number of corporations and individuals have experienced the benefits of experiential learning with horses in leadership development and personal growth. Horses mirror the energy of what people act and feel. In my horse coaching work, I capitalize on this mirroring. It is very hard to ignore a 1000 pound living, breathing being in your immediate surrounding acting out the things that goes on inside of you. This is one reason why horses many times are more effective teachers than any human can be. A horse is a prey animal, constantly on call looking for danger in its environment. Therefore they are masters at reading their surrounding and interpreting intent in other beings. They are dependent on clear communication between herd members in order to flee danger. As they live in a hierarchical system, they assert their place by following the leaders and by letting individuals lesser in rung know their place. When humans enter the space of a horse, they are treated as members of the herd. The horse expects clear communication, congruent behavior, clear leadership and above all – a relationship that determines if the human is worthy of trust and therefore safe to be with. In the following pages I invite you to read more about how you can include horses in your personal growth and leadership development training. 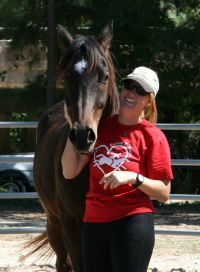 I also work with equestrians who want to improve their relationship with their horse and become more centered at the same time. As an international level equestrian I also share my knowledge with competitors in horse sports and other sports. concrete5 - open source CMS © 2018 Engquist Coaching. All rights reserved. Sign In to Edit this Site!